Few days ago I was spending my time on Tumblr checking nail art pictures, when I spotted this gorgeous manicure. Of course I googled more for details and after seeing more detailed pictures, I knew I had to try it myself. The manicure I'm talking about was done by Chanel and here's a picture. For the autumn/winter 2012-13 couture show, nails were painted in a limited-edition Silver shade from 2007, before spring 2012's May was applied in an oval shape. Two colors that were used on Chanel Haute Couture Fall 2012 runway were Silver (2007, discontinued) and May (Spring 2012). I made lines even cleaner with brush soaked in remover. 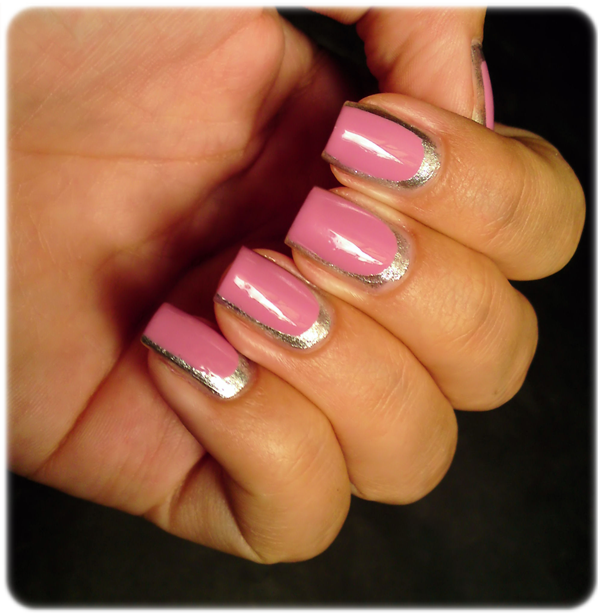 I gently removed the pink where needed without ruining the silver foil underneath, because foils really stick on nails. Of course you can always apply top coat over silver and before pink. to be really sure you won't ruin the base color with brush and remover. looks great! love it! need to try that one out! i just did 4 different nailart manicures (for a competition)... all including pink... i just love pink! I love this and would definitely wear it!!! oh wow this is so beautiful!! I'm not a big fan of ruffian manicure but I do like this style a lot!! I wanna try!! This looks beautiful on you. I might have to give this a try. Wow! This looks amazing on you... very very pretty! thanks for inspiring me, ivana! Oh thank you Monika for sharing a link! :h You did a great job! As I already said, this is gorgeously precise, you did an awesome job with this mani! I'll try to reproduce this technuque, maybe with different colours. You did an awesome job. I don't trust my steadiness to replicate it, though. so in love with this! You make it look effortless! Perfect! Totally an Ivana manicure ♥. Really compliments your nailshape too. Yeah, your mani came out way better than the others I've seen on the net! I tried it out with less success (using a lighter shade by OPI). But, my nails are shorter now too. This has inspired me to try again later once my nails are a tad longer.. with a darker pink. Thanks for sharing! This is incredibly gorgeous ! OUTSTANDING! How to capture neons on picture?